spring month of April is in its full mode and therefore let me do wrap up of last month’s food for soul for YOU. Homo Faber was second fiction book of the March 2010 and I have crunched this novel by Swiss author Max Frisch within one weekend. I have never heard about Max Frisch, but I was intrigued to read it, after an online chat with my German friend, when I have told him, that: “Nothing in life is coincidence”, he just replied: “Read Homo Faber, this is my favorite book of all the times”, so me being act here and now kind of a person, I have ordered it on Kindle immediately. It is MUST READ book! Tell me then, how did you like the story of “coincidences”. 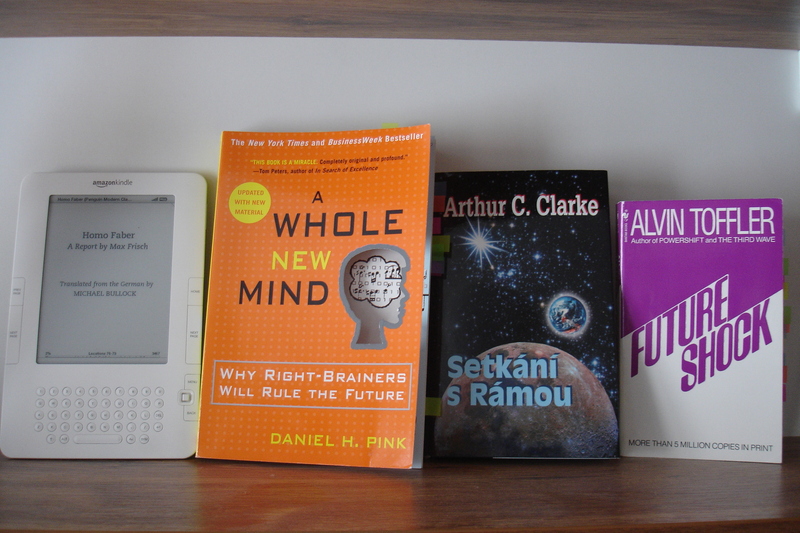 I was encouraged to read A Whole New Mind by Dan Pink by many people I follow and I am glad, that I have “incidentally” found Dan’s book while browsing tiny book shop during my last day of visit in Dubai. “Right-brainers” will rock the world and will be the future. Dan has summarized 6 senses of the whole new mind, which will be in demand of the new era of conceptual age, age of creators and empathizers! The right hemisphere of the brain is the picture, left is the thousand words. “SAT-ocracy” is a regime in which access to good life depends on ability to reason logically, sequentially and speedily. Last century, machines proved they could replace human backs. This century, new technologies are proving they can replace human left brain. More important are qualities that are tougher to quantify. Conceptual Age is “High Touch”= ability to create artistic and emotional beauty, to detect patterns, to craft a satisfying narrative and to combine seemingly unrelated ideas into a novel invention. Have a super cool week ahead full of creativity and novelty my dear Super Cool Gang! And I simply loved your chairs. Ivana, I always look forward to reading your book reviews — thanks for taking the time to do them! I’ve decided to go with Rendezvous With Rama for my next read! As mentioned earlier, Linchpin is excellent! I found some good food for my thoughts here! 😉 aaw, super cool that you have picked up Linchpin as well! That’s a nice roundup. I hadn’t seen Vook’s before, but I like the concept and I’ll check out Seth’s.